Algae to Thrive in Toxic Times! THE MARTIAL ART OF WELLNESS: Algae to Thrive in Toxic Times! Micro-Algae: The Next Generation of Green Superfoods for Thriving in Toxic Times! The global food supply is heavily tainted. Even hothouse organics don’t ensure sufficient nutrition, due to the loss of nutrients in our soil and pollutants from our air, rain and water supplies. On top of this, we must consider the daily overload from toxic pesticides, geoengineering particulates, GMO toxins and other pollutants. So how can we provide our bodies with the nutrition our cells require, while supporting our body’s natural detox processes at the same time? Healthy cells = healthy bodies; unhealthy cells = sickness and disease. By keeping the cells healthy, the body is naturally able to repair itself. Ancient humans, Aztecs, Mayans and tribal Africans have long been aware of this natural life-giving food source. The largest mammals on Earth – the whales – know this too. However, our modern societies have lost sight of the nutritional value of micro-algae. Editor’s note: With bee colonies around the world collapsing due to exposure to toxic agricultural pesticides, the use of bee pollen is not recommended for human purposes. The bees need our support, not the other way around. Algae also contain large amounts of beta-carotene (pro-vitamin A), B vitamins, and vitamins C and E , and many minerals in high enough amounts to be considered perfect human food. Most importantly, the essential amino acid profile of algae is virtually identical to that required by the human body. 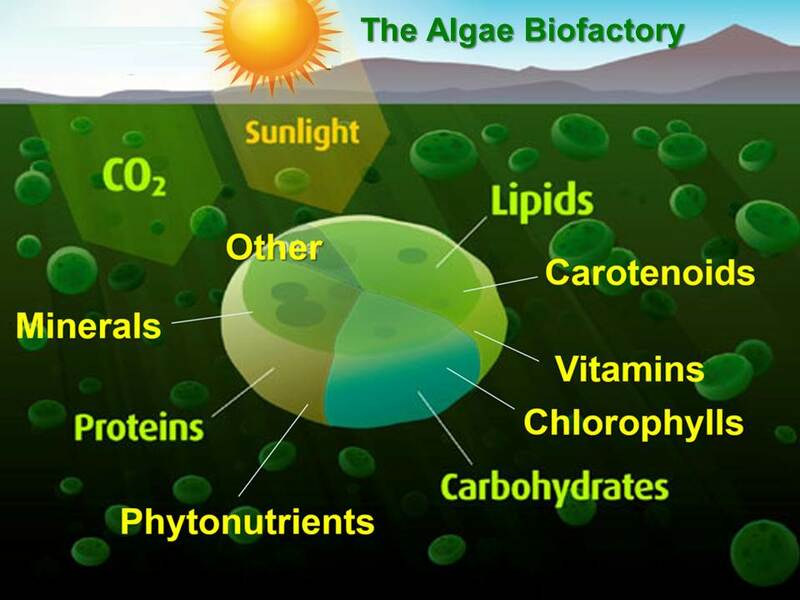 Certain algae like those in Dr. Kiriac’s formula are the most efficient producer of energy on earth, and also the most efficient donor of that energy to the first consumer. Today millions of people are taking micro-algae in the form of Chlorella and Spirulina. But what Dr. Kiriac discovered in his research is that the best possible nutrition and optimization of endocrine function is provided by a very precise combination of different algae. Between 1973 and 1986 Dr. Kiriac and his team selected over a thousand algae to study and test for their individual benefits, as well as their synergistic and combined potentials. For example, they studied 65 strains of Spirulina alone and spent 2 years studying Chlorella. As research progressed, over 20 different species of algae were trialled (individually and in combination) in both animal and human subjects. Specifically, Dr. Kiriac also tested for solutions to a variety of diseases, including cancer, Marek’s disease and Leukemia, with the research budget surpassing the pharmaceutical industry budgets for comparable major trials. Dr. Kiriac’s research was blessed by many synchronicities. In 1985, for example, a light was accidentally left on overnight in one of the bio-reactors (the enclosed facilities where the algae is grown), exposing the algae culture to light for a longer period of time than the scope of testing had included. The result was an increase in beta-carotene production. This accidental discovery led to further experiments into alterations in growing conditions such as lighting, ambient temperature and water conditions. The results were the controlled increase or decrease in various nutrient combinations in the algae. By the end of February 1985, after nearly 15 years of research, Dr. Kiriac and his team had narrowed down their selection to the synergistic benefits of four different algae – Spirulina Platensis, Spirulina Pacifica, Dunaliella Salina and Haematococcus Pluvialis (for its Astaxanthin content.) Individually none of these algae could eradicate the cancers in the trial populations quickly enough, however, over time Dr. Kiriac determined that with precise hydroponic enhancements (such as light, temperature etc.) to the algae’s living conditions, in the proper combination, the animal populations were able to receive potent and absorbable nutrition directly to their cells. And the results were remarkable. At this point several millions of dollars had been spent by the (then) Soviet government into the application of the formula to livestock. However at the same time, conservative parties were being lobbied by the pharmaceutical industry to introduce antibiotics and growth hormones to the country’s livestock; a move that ultimately stifled the widespread adoption of algae-based solutions to livestock diseases. How Does This Algae Formula Work and Why is it So Effective? Why is this 4-algae formula so effective? 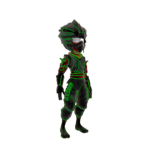 First, due to the extensive research deriving a perfect synergistic balance of algae. Second, the pure enclosed growing environment. Third, the algae is fed by highly mineralized water from 2000 feet below the surface. Fourth, it is freeze dried to eliminate mold. Fifth, it contains 15,000 nutrients and trace nutrients, including all known amino acids, vitamins and essential minerals, thousands of enzymes, carotenoids, high levels of chlorophyll, Omega 3,6,9 and GLA fatty acids, and unique phytonutrients and phycobilins found only in algae. And finally, each batch is certified pollution-free by an independent lab. In addition to providing complete nutrition to every cell in the body, these algae are also extremely efficient foods that can easily cross the blood-brain barrier to reach the brain. Several phytonutrients and pigments found in Dr. Kiriac’s formula, like beta carotene, alpha carotene and astaxanthin have been proven in human clinical trials to penetrate the blood-brain barrier and the blood-iris barrier. Moreover, the bio-availability of Dr. Kiriac’s formula allows it to reach areas of the brain that are usually difficult of impossible to reach – including the all-important hypothalamus. It is because of the formula’s ability to access the hypothalamus that Dr. Kiriac coined the phrase “awakening the genius within”. The hypothalamus is a region of the brain that controls most of our metabolisms and bodily functions. 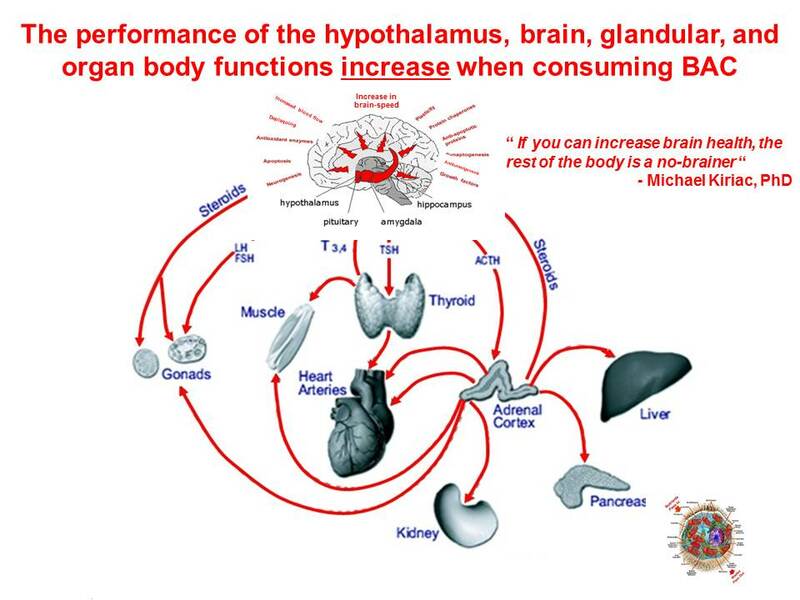 The main function of the hypothalamus is homeostasis, the process of maintaining the body’s status quo by managing a myriad factors such as energy, blood pressure, body temperature, fluid and electrolyte balance, body weight, etc. the digestive system with its assimilation, absorption and elimination functions. The hypothalamus is made up of billions of cells. Only when these cells are healthy will the hypothalamus perform adequately its management role. Thus it needs hundreds of important nutrients every day. Only with these nutrients and with the derived energy from these nutrients will these cells grow, repair, defend from attacks and perform their localized metabolic functions. When we experience deficiencies in these nutrients, endocrine, nervous, lymphatic, cardiovascular and digestive functions ultimately suffer. Research has shown that the HPA axis performance increases in response to the consumption of Dr. Kiriac’s micro-algae formula, thus the performance of all glands and organs increases, instead of their normal decline with age. Furthermore, as the HPA regulates the production of Calcitriol  critical Vitamin D metabolism is also enhanced. Ingesting this formula is quite different from our normal attempts at supplementation, which often involves synthesized supplements that are poor in bio-availability, or other forms of algae (such as Spirulina, Chlorella or Astaxanthin) that neither pass the purity test nor synergize with other components. Instead of addressing the body’s deficiencies with isolated supplements – zinc, iron, vitamin C, vitamin D etc. – Kiriac’s four-algae formula addresses the human body as a complete, synergistic organism, empowering the innate healing of our body’s cells. As most commercially available micro-algae supplements are grown outdoors, it provides a real challenge for human consumption. One reason microalgae are so precious to our natural environment is that they soak up the toxins, heavy metals and environmental pollutants around them. However, when you eat them, you are also receiving the contaminants absorbed by the algae into your body. Dr. Kiriac has solved this challenge by growing the algae in enclosed bioreactors that are completely free from pollutants, using mineral dense water extracted from 2,000 feet deep below the surface of the Kamchatka peninsula. The BioSuperfood formula is then shipped to Canada where is it encapsulated, but not before each batch is assessed by an independent lab and certified as free of mold, heavy metals and other pollutants that can typically be a problem with algae. For these reasons, Dr. Kiriac’s specific four-algae formula has been proven extremely effective at assisting the body to achieve and maintain optimal health. Immunostimulating activity of lipopolysaccharides from blue-green algae by L. Besednova, et al. 1979. Pub. inZhurnalMikrobiologii, Epidemiologii, Immunobiologii, 56(12) pp 75-79. Russia. Study on effect and mechanism of polysaccharides of spirulina on body immune function improvement. G. Baojiang, et al. South China Normal Univ. China. Pub. in Proc. of Second Asia Pacific Conf. on Algal Biotech. Univ. of Malaysia. pp 33-38. April 1994 China. Moldova Person of The year (Michael Kiriac) – Moldova Television, Documentary 1987 – extracts from Documentary 2002. Thomas, R., Kiriac, M. – Awakening the Genius Within: The Life of Michael Kiriac – Publisher: CompWellness Org. – Pub. USA – Jan 2003. Immunostimulating activity of lipopolysaccharides from blue-green algae. by L. Besednova, et al. 1979. Pub. inZhurnalMikrobiologii, Epidemiologii, Immunobiologii, 56(12) pp 75-79. Russia. Inhibitive effect and mechanism of polysaccharide of spirulina on transplanted tumor cells in mice. byLisheng, et al. 1991.Pub. In Marine Sciences, Qingdao, N.5. pp 33-38. China. 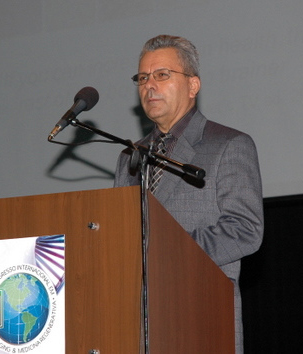 Nominated Moldova Person of the year: In 1987, Mr. Kiriac was nominated the person of the year in his country of Moldova for his altruistic support of the Chernobyl crisis and for the resounding achievement and successes at the most economically important poultry center with its financial return for Moldova. 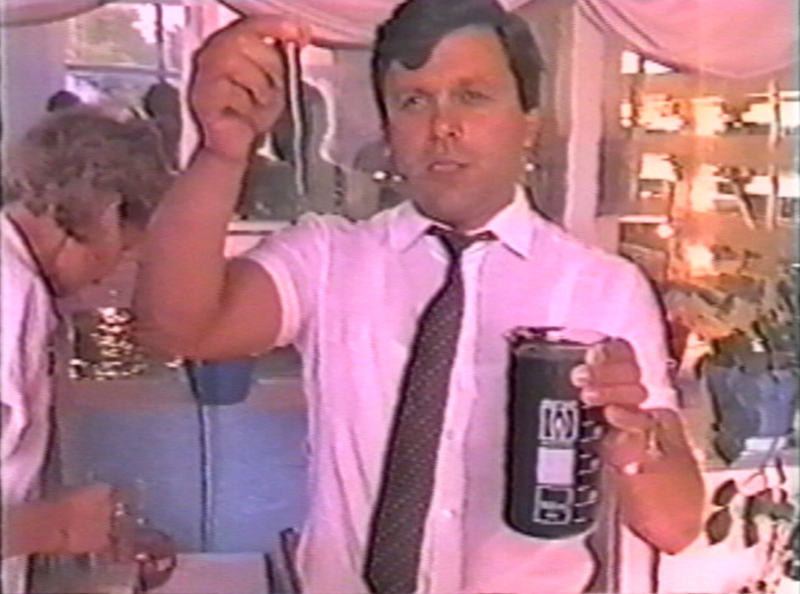 A 110-minute-long documentary film was made for the occasion and introduced on national television by Mr. Ciubuk, the then Prime Minister of Moldova and his Minister of Finance. Gold Medal & Special Award – Earth Ecology – (Brussels, Belgium 1995) Industrial Use of Poultry Waste (Droppings) – Invention honored and recognized during the International Eureka Show, granted by deheer Lue Van Den Bossch. The goal of this innovation was in the elaboration of a new technology, which uses transformed poultry droppings at an industrial level. Marc Gimbrere was run over by a car at the age of 28 and has been on the path of the healer ever since, focusing on energetic, metaphysical and nutritional approaches to achieving and restoring optimal health and well-being. Zhara Mahlstedt is a mother, researcher and health enthusiast. Over the past 6 years, Zhara has self-studied metaphysics, cellular health, energy healing and out-of-the box solutions for empowering the body’s innate wisdom.